As State Legislators, we have a solemn obligation to defend the rights of the people and protect the sovereign authority of our states, but the powers in Washington D.C. have made that almost impossible. Decades of out of control spending and a slow erosion of the balance of power between the states and the Federal government have all but destroyed the constitutional federalism that our founding fathers established. 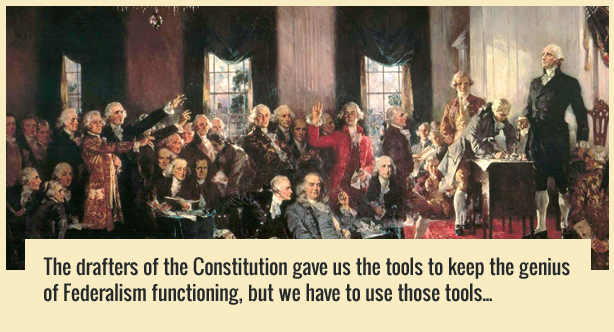 The drafters of our Constitution knew this could happen and so they gave us the tools to keep the genius of Federalism functioning, but we have to use those tools. The stronger we are, the sooner we can take the credit cards away from Washington and put our nation back on track.